It is Oseltamivir total synthesis rush-hour this year with rendition number 7 (see earlier post on number 6) this time from the people responsible for the commercial production of the compound: Hoffmann-La Roche (Zutter et al. 2008 DOI). Starting material: cheap 2,6-dimethoxyphenol. Novelty: stereoselectivity introduced by asymmetric biocatalysis. Disappointment: method involves azides. Step 1 converts phenol 1 to triether 3 with the mesilate of 3-pentanol and a strong base. Bromination with NBS gives dibromide 4, and subsequent ethoxycarbonylation with CO, palladium acetate and dppp the diester 5. The next step is a all-cis hydrogenation, tagged "quite remarkable" as only one compound (6) out of 10 possible diastereomers is formed. Alcohol deprotection (TMS-I) gives meso diol 7. Desymmetrization of this compound to chiral 8 with just one of the ester groups converted to a carboxylic acid group is performed by a pig liver esterase which again "quite remarkably" is able to endure 10% substrate loading. Next up is a Curtius degradation to 9 with capture of the intermediate isocyanate by the alcohol group. 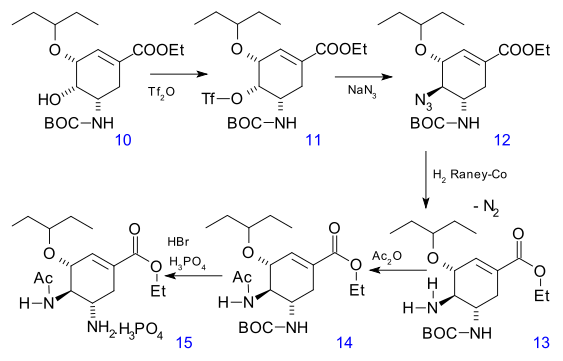 The amine group is protected as a BOC amine and elimination of the alcohol group with sodium hydride is accompanied by a ("unique") decarboxylation to 10. 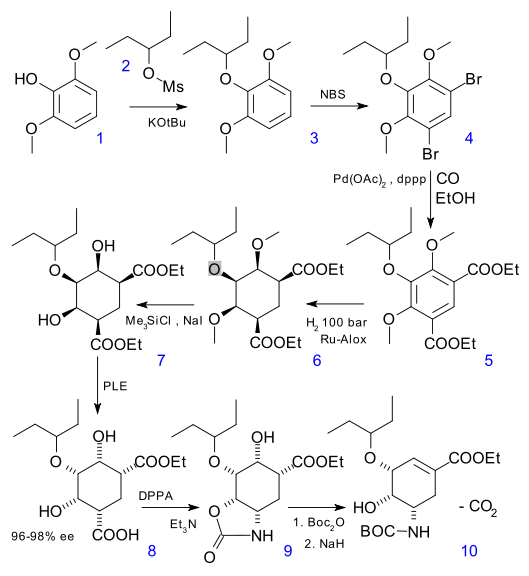 An azide group is introduced in 12 through triflate 11 (inversion of stereochemistry). In the final steps the azide is reduced to the amine 13, acylated to 14 and deprotected (HBr) to 15 as the phosphoric acid salt. All other groups involved in this field to date advertise that their method is azide-free (dangerous!) and even the current commercial production method does not use azides. In this regard its back to square one for Roche.